You can make both types of pasta at home. Fettuccine and linguine are both pastas made from durum semolina flour. Of the 600 potential pasta shapes found in the world today, fettuccine and linguine are among the simplest and oldest. Pasta is thought of as a quintessentially Italian dish, but the Chinese were making noodles from rice flour as early as 1700 B.C. The ancient Etruscans, who occupied what is now central and western Italy, made a type of baked pasta from at least 400 B.C. The Arabs were probably the first to dry pasta and brought it with them to Sicily in the 8th century. Linguine is similar to fettuccine, but it is narrower. It is about the same width as spaghetti, but it is flat, not round. Linguine originated in the coastal Liguria region of northern Italy and the name means, "little tongues." True to the region's coastal influence, linguine was often with clams or seafood. It was probably developed after the first mechanical pasta presses were invented in the 1600s. Linguine cooks a bit more quickly than fettuccine, but it is suitable for almost any type of sauce, including pesto, white sauces and red sauces. The most famous linguine dish is linguine con vongole in bianco, linguine with a sauce of clams, olive oil, garlic and other seasonings. In Italy, this "white" pasta is made with whole clams in the shell. In the United States, this dish often incorporates chopped clams. If you've ever made homemade noodles for soup, you can understand the humble beginnings of fettuccine. The first pastas were cut by hand from dough rolled out on a table. Although pasta is considered a budget food today, it wasn't until the invention of the pasta press that pasta became a food for the masses. Semolina flour has a granular texture, rather than a powdery texture. Men had to stomp on it for hours to make it soft enough to roll. The Etruscans and Romans first made lagane, or sheets of pasta similar to lasagna, but fettuccine was probably one of the next types of pasta to be produced. Fettuccine, which means "small ribbons" in Italian, is a flat pasta that is typically 1/4 inch wide. Because of its width, it holds up better to thick, creamy sauces than spaghetti or linguine. The most famous dish that uses these noodles is fettuccine Alfredo, a rich, creamy dish that includes cream, Parmesan cheese, butter and sometimes eggs. Fettuccine Alfredo was invented in Italy, in 1914, by Alfredo di Lelio, as a dish to satisfy his pregnant wife. The original dish contained butter and Parmesan cheese, but no cream, which is how it is made in Italy. However, you can use fettuccine noodles for both red and cream sauces. 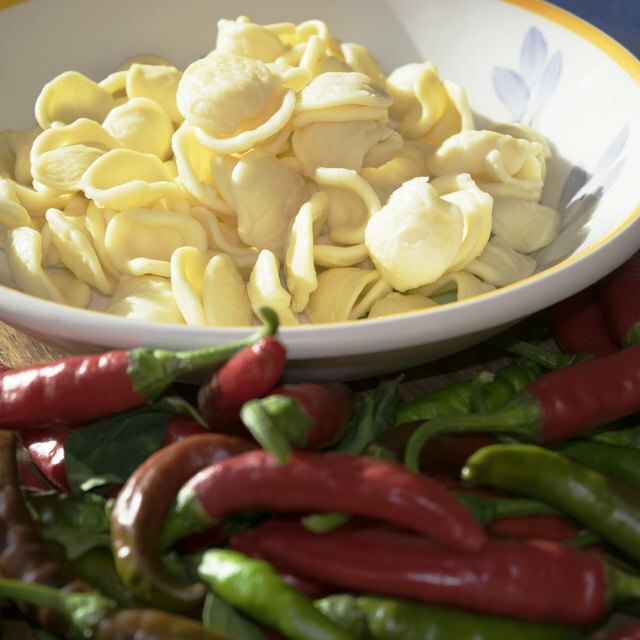 Although the first pastas were fresh, dried pasta has become the most common pasta available. Additionally, though, you will find gluten-free, whole wheat, whole grain and vegetable pastas. You also have the choice of dried or fresh pasta, which is made from high-gluten flour. 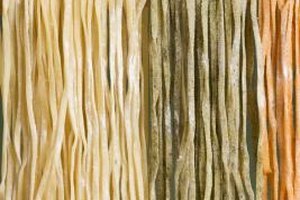 Dried pasta is economical, widely available and has a long shelf life. It holds up well to thick, flavorful sauces. Fresh pasta has a mild flavor and a tender texture. Use it for light, subtly flavored sauces. Whether you opt for linguine or fettuccine, most pastas are stored and prepared the same way. Bring a large pot of water to a rolling boil and add a bit of salt. Add the pasta and boil it, just until it is tender, but not mushy. The center of the pasta should remain slightly firm. Drain the pasta and sauce it. Store fresh pasta in a refrigerator set at 40 degrees Fahrenheit and use it no later than the use-by date on the package, or no more than four to five days. Store dried pasta in a cool, dark pantry for up to two years. Store any leftover cooked pasta in a fridge set at 40 F within two hours of cooking, according to the USDA. Put the pasta in a covered container and use it within three or four days. The Kitchn: Dry Pasta Versus Fresh Pasta: What's the Difference?